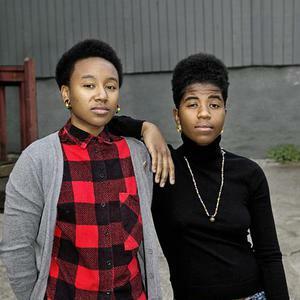 THEESatisfaction is an American R&B Hip-Hop duo based in Seattle consisting of rapper Stasia "Stas" Iron and singer Catherine "Cat" Harris-White. Stas was born and raised in Tacoma, Cat in Hawaii and Seattle. The pair met in 2008 while attending the University of Washington. Stas, the rapper of the duo, frequented Cat's open mic performances. Stas recalls, "I was attracted to Cat's voice, I would go to the open mic and close my eyes and zone out whenever she sang. I finally had the courage to speak to her? it took a while." Stas was born and raised in Tacoma, Cat in Hawaii and Seattle. The pair met in 2008 while attending the University of Washington. Stas, the rapper of the duo, frequented Cat's open mic performances. Stas recalls, "I was attracted to Cat's voice, I would go to the open mic and close my eyes and zone out whenever she sang. I finally had the courage to speak to her? it took a while." In 2011, Sub Pop Records signed the duo after hearing their guest-track on Shabazz Palaces' 2011 Black Up album. The pair released their debut full-length album, awE NaturalE on Sub Pop Records March 27, 2012.